These lectures were recorded at Naropa University in Boulder, CO in the summer of 1981. 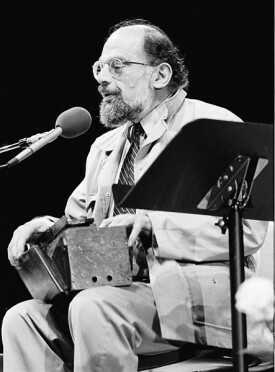 Tape 1 - The first class in an Allen Ginsberg course on Expansive Poetics. Ginsberg opens the class with a brief history of the topics of courses he has taught in the past. He then explains his expectations for this course and the material he plans to cover in the sourcebook/anthology he is compiling. He then reads Geza Roheim's Children of the desert, Shelley's Hymn to intellectual beauty, Ode to the West Wind and the end of Adonais. The class discusses rhythm and the expansive breath and how it influences one's work. Tape 5 of an 11 tape series of a class taught by Allen Ginsberg on Expansive Poetics. Subject matter includes background on such movements as the Futurists, Acmeists, and Imaginists as well as readings of work by various artists including Osip Mandelstam, Jorge Ivanov, Nikolai Gumilev, William Carlos Williams, and Anna Akhmatova. Tape 11 of an 11 tape series of Allen Ginsberg's class on Expansive Poetics. Subject matter includes background on such Russian writers as Kaysin Kuliev and Sergei Yesenin. Also included are readings of work by Gordon McVay, Vladimir Klebnikov, and Sergei Yesenin. You can find the course listed in the Literature section of our big collection of 1200 Free Online Courses.